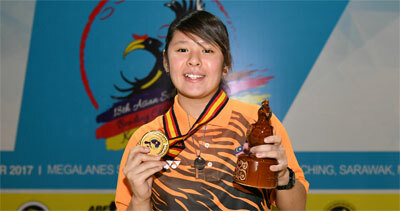 13th November, Kuching: Gillian Lim and Puteri Nurul Dini gave host Malaysia off to a great start at the 18th Asian School Tenpin Bowling Championships underway at Megalanes Sarawak winning the gold and bronze in the Girl's Singles event. Regina Daval-Santos of Philippines got off to a cracking start with 236 in her opening game to lead Puteri Nurul Dini of Malaysia A in second, just one pin away as Emily Johnston of Australia and Fiona Yew of Singapore A followed closely behind. Johnston added a sizzling 258 in her second game to take over the running which she kept after the third game despite knocking down 190. Daval-Santos trailed in second before Lim moved up into second spot. Lim, who started off well with 206, 223 and 210, also posted a stunning 253 to become the new leader past the halfway mark. Yew rolled 235 to take over secons spot as Johnston slipped down to third with Nurul in fourth. Two Singaporeans, Yew and Nur Amirah Ng stayed close behind the leading pack. Although Lim managed only 183 in her fifth game, she remained in the lead but found her lead of 50 pins reduced to just 4 pins when Nurul fired 234 to trail her team-mate. Johnston and Yew tied for third with the final game to play. The Aussie ended the strongest with 211 but fell short by seven pins when Lim downed 196 to seal the gold medal with 1271. 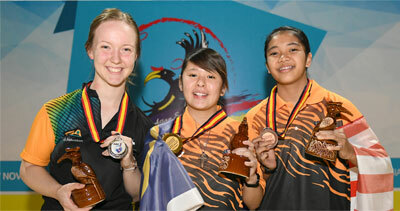 Johnston settled for the silver medal with 1264 while Puteri Nurul clinched the bronze medal with 1241. Yew missed the podium by 10 pins finishing fourth while Nur Amirah Ng of Singapore B stormed home with 220 to complete the top five with 1214. A third Singaporeanm Shin Zong Yi also stormed home with 226 but ended just two pins behind her compatriot. The boys will take to the lanes after oiling to contest their opening Singles event later today. Photos by Daniel Winardi in Kuching, Sarawak.